Join the Newtown Bookshop for a Special Treat! We are welcoming Canine Good Citizens: Berry, Blue, and Peach on October 27th from 10:30 - 11:30am! 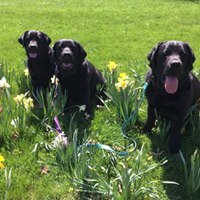 These wonderful dogs would love to meet you and have you read to them and are great and gentle with children. And they are Gus's Mom and siblings! Imagine the positive motivation this gives to the child as they sit by, read to and pat a calm and gentle dog.